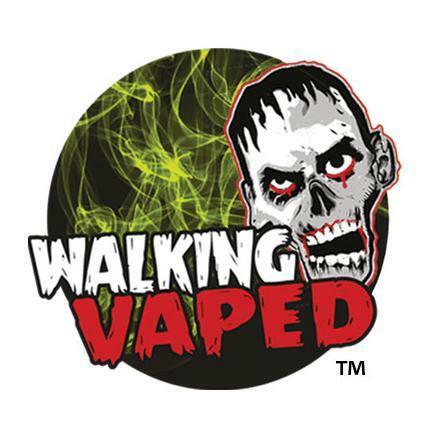 A month or so ago, my editor wrote an article on The Walking Dead inspired E-Liquid Companies, and mentioned he had not had the privilege of trying some of those juices. I guess one of the manufacturers read the article and decided to send out a “scare package” . He still doesn’t get to try it because as soon as I heard it was coming in, I made him give them my address instead of his. The Walking Vaped sent us 5 flavors to try, today I will be reviewing their Strawberry Labotomade e-liquid. 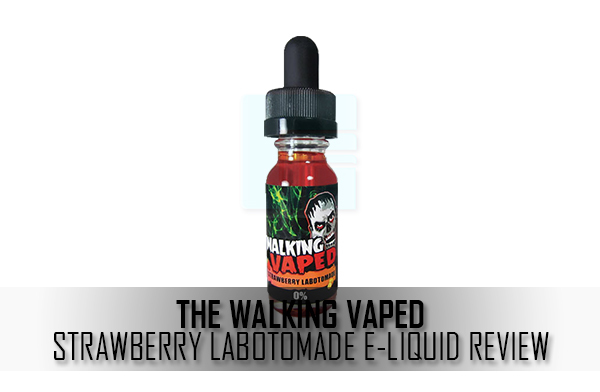 The Walking Vaped Strawberry Labotomade, like its brothers is packaged in round glass bottles. Tried and true simplicity is the key. Each of the 15 ml e-liquid containers I received were topped with a child proof pipette cap and were shrink-wrap sealed from bottom to top. There was a perforation down one side of the seal for easy opening but the fact that the company took the extra step to ensure that the product is tamper sealed shows that they care about the customers receiving their product unadulterated. The dark label features a twisted dead head apparently letting off green gases inside the Walking Vaped logo which sits atop the flavor profile and nicotine level. Turn the bottle to the left, you will find the date of manufacture and obligatory warning labeling, directly opposite the list of ingredients and a “proudly made in the USA” motif. As a vapor who has gone through several hundred millilitres of strawberry lemonade e-liquids, allow me to tell you that this one stands out from the pack. When you open the bottle for the first time and actual smells its contents, the strawberry smell is light and the lemonade smell is, in all honesty, a resting under tone. I dropped it on my coils and still the strawberry scent was prevalent and my mind told me I was about to get a sweet vape. That first hit made me pull my mod back from my mouth as the lemonade made me feel as though I really had just had an ice pick stuck in my eye, the kick of the tart was AMAZING! It was quickly replaced by the sweetness that my brain had told me I was going to receive but by that point I was already salivating. If the manufacturers truly were going for a refreshing in your face lemonade experience,they achieved it to no end. Reading the description they gave on their website says that the amazing violation of my taste buds was exactly what they were going for, and for that I salute them. The side of the bottle states this is a 70VG/30 PG mixture and I have found recently that this seems to be the magic number for amazing flavor and great cloud production. Whether being used in a Sub Ohm tank like the Morpheus V2 or an RDA, the production is thick and creamy.